Wi-fi everywhere. Broadband Internet. On-demand video. Amazingly, an online, Second Life avatar (a virtual person used in on-line gaming, for those of you unfamiliar) requires more energy (1700 kWh per year) than the average real-life Brazilian (1000kWh/yr.)!! You can also choose a green Internet Service Provider (ISP). E Magazine published an article in 2006 about green ISPs, and you can find others by searching the web. I have been asked to present this idea at the 2009 Policy Greenhouse being sponsored by DC Councilmember Mary Cheh and hosted at George Washington University on Friday, July 10. I am pleased that my idea was accepted as one of eleven innovative ideas for achieving high impact environmental solutions. The premise is simple: apply the concept of a Portfolio Standard (a kind of Cap and Trade) with market-price trading to the issue of urban canopy. - Urban canopy is the layer of trees, branches, leaves, etc. that cover the ground when viewed from above. - Urban forest is the total system of trees and other plants that exist in an urban area. - Cap and Trade is a system to limit something, such as a pollutant, by designating an overall cap and allowing all the parties under the cap to buy and sell. It's analogous to secondary market ticket sales for concerts or sporting events. The "cap" is the total number of seats available for the event. Generally once all those tickets are sold, then a secondary market is born on sites like StubHub to allow people with tickets to sell to those without. The total number of tickets does not change, but ownership of those tickets can. - Portfolio Standard is the other side of the same coin as Cap and Trade, except instead of trying to reduce or limit something, we are trying to increase it. A minimum requirement is set and each entity has to meet or exceed that requirement--either directly or by purchasing enough "credits." A common use of this concept is a Renewable Portfolio Standard, in which a state or other entity requires that x% of the electricity generated will come from renewable sources. What makes this concept attractive is that it creates an economic incentive to go above and beyond, because when one does, the extra environmental benefits can be sold to someone else in the market. So let's apply this idea to urban canopy. Since my presentation is to the District of Columbia, I'll use data specific to DC. In contradiction to the American Forests report, Casey Trees estimates tree coverage as 36%, so a consistent methodology will need to be established. - Reduction in the urban heat island effect--the effect that makes cities hotter than the surrounding areas. Buildings in urban heat islands require more energy to cool. Hotter temperatures also lend to greater production of ground-level ozone, also known as smog. Trees reduce temperatures two ways: through shading and through transpiration (the emission of water vapor from the leaves). - Reduced stormwater runoff. Trees capture rainwater as it falls and absorb it through their roots. Reduced stormwater runoff reduces pressure on wastewater treatment facilities, reduces the risk of localized flooding, reduces toxins and particulates from flowing into streams and eventually into the Chesapeake Bay in the case of DC. - Improved air quality. In addition to the air quality benefits of reduced urban temperatures, trees themselves can filter toxins from the air. They also sequester carbon, helping to reduce the risks of climate change. - Wildlife habitat. Trees and other urban plants provide shelter and food for wildlife, including migratory birds and butterflies. - Improved aesthetics. Trees look nice. The simplest way to apply the portfolio standard to the DC urban tree canopy is to require each property to meet the same minimum requirement and ratchet it up slowly over time. Let's assume that the current canopy is still 21% as it was in 1997. The portfolio requirement could be set at 20% to start (it's a good idea to make the initial standard relatively easy to accomplish in order to get the system operating and keep prices low so there is less likelihood of backlash). If my property is 6000 square feet, then I would be required to have 1200 square feet of tree canopy--either actual canopy or "credits" from someone else. Suppose my lot is 50% covered with trees--3000 square feet. This is good, because I have an extra 1800 square feet of canopy that I can sell. Now suppose the apartment complex down the street is on a 30,000 square foot lot, so their 20% requirement dictates 6000 square feet of tree canopy. However, they only have 4200 feet of tree cover. That means they need to purchase 1800 square feet of additional tree canopy from someone to meet their requirement. Voila! I can sell my 1800 square feet of extra credits to them, and we both now meet the standard. Because I have gone above and beyond the minimum, I have been able to make money from the sale of my canopy credits. The apartment complex has had to pay for their lack of tree canopy. This is how it should be: our incentives are perfectly aligned with our environmental goals. If the price is high enough, the apartment owner will look for ways to plant more trees instead of buying credits. In fact, that is the next step. After the initial couple of years, the requirement should start increasing. 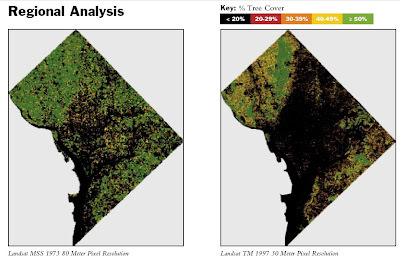 If the District's goal is to return to 37% tree canopy as it was in 1973 (or 40%, which is what American Forests recommends for urban areas; or 50, which is what Casey Trees suggests is feasible), then it can slowly increase the requirement over a couple of decades. Each year the value of tree canopy will rise so that the incentive to plant trees (or not cut them down) gets greater and greater. Since a lot of the urban tree canopy is on public land, parks specifically, the city itself can earn money from selling its credits. This is politically tricky ground, though. In theory I like the idea of the city being driven by the same financial incentives as the rest of the market. However, it may want to create a mechanism in which the revenues received through the sale of canopy credits go to enhancing parks or improving environmental performance or other programs that residents will support. In addition, it's important that the system be designed so that it does not create the appearance that the city can manipulate the market to its advantage. One other appealing feature of this concept is that it is completely scalable. A pilot program could be designed for a single neighborhood, district or ward. Everything works exactly the same, just on a smaller scale. There are additional details that I won't go into here. Perhaps in a subsequent post.